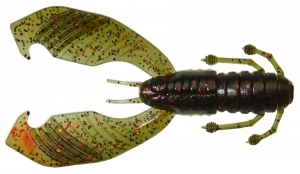 Gunki Boogie Craw imitates the freshwater crayfish perfectly with Crayfish are on the menu of every predator you can’t go wrong. A two part body Lure which is extremely supple and the claws flap at the slightest movement which often triggers a reaction bite. Additional bristles and claws add to the realism of this lure. Can be fished on a loaded head, behind a jig or a chatterbait. Best worked by twitching back along the bottom. Great for deep swims or near cover. Shellfish flavour and salt are impregnated in the body. Quick tip if you are short of insect type baits fishing try cutting a Boogie Craw in two and use the abdomen section as an insect imitation. Flavoured with Shellfish flavour and salt attractant which is impregnated in the body.